Antisera to human NALP3 were raised by repeated immunisation of goats with highly purified antigen. 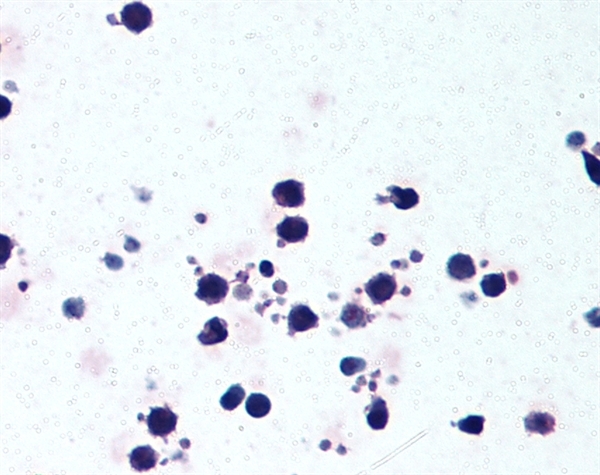 Purified IgG prepared from whole serum by affinity chromatography. Small volumes of anti-NALP3 antibody vial(s) may occasionally become entrapped in the seal of the product vial during shipment and storage. If necessary, briefly centrifuge the vial on a tabletop centrifuge to dislodge any liquid in the container`s cap. Certain products may require to ship with dry ice and additional dry ice fee may apply. Goat anti Human NALP3 antibody recognizes human NACHT, LRR and PYD domains-containing protein 3 (NALP3), also known as Angiotensin/vasopressin receptor AII/AVP-like, Caterpiller protein 1.1 or Cryopyrin. NALP3 is a 1036 amino acid ~120kDa cytoplasmic protein belonging to the NLRP family, containing a single DAPIN domain, nine leucine-rich repeats and a single NACHT domain (UniProt: Q96P20). NALP3 is involved in inflammation and immune responses. NALP3 may function as an activator of NF-kappaB signalling and play a role in the regulation of inflammation and apoptosis (Choi and Ryter 2014). NALP3 is strongly expressed in polymorphonuclear cells, osteoblasts and chondrocytes, NALP3 can also be detected in non-keratinizing epithelia of oropharynx, esophagus and ectocervix and in the urothelial layer of the bladder. Mutations in the NALP3 gene have been associated with familial cold autoinflammatory syndrome (Hoffman et al. 2001), Muckle-Wells syndrome (Dodé et al. 2002), chronic infantile neurological cutaneous and articular syndrome (Feldmann et al. 2002) and neonatal-onset multisystem inflammatory disease (Aksentijevich et al. 2002). Goat anti Human NALP3 antibody has been used successfuly for the detection of NALP3 in the eyes of rats by immunohistochemistry on formalin fixed, paraffin embedded sections (Liu et al. 2014). Immunohistology - Paraffin: Maximum Dilution: 2.5ug/ml; Application Note: This product requires antigen retrieval using heat treatment prior to staining of paraffin sections. Sodium citrate buffer pH 6.0 is recommended for this purpose. NCBI/Uniprot data below describe general gene information for NALP3. It may not necessarily be applicable to this product. NLRP3: May function as an inducer of apoptosis. Interacts selectively with ASC and this complex may function as an upstream activator of NF-kappa-B signaling. Inhibits TNF-alpha induced activation and nuclear translocation of RELA/NF-KB p65. Also inhibits transcriptional activity of RELA. Activates caspase-1 in response to a number of triggers including bacterial or viral infection which leads to processing and release of IL1B and IL18. Defects in NLRP3 are the cause of familial cold autoinflammatory syndrome type 1 (FCAS1); also known as familial cold urticaria. FCAS are rare autosomal dominant systemic inflammatory diseases characterized by episodes of rash, arthralgia, fever and conjunctivitis after generalized exposure to cold. Defects in NLRP3 are a cause of Muckle-Wells syndrome (MWS); also known as urticaria-deafness-amyloidosis syndrome. MWS is a hereditary periodic fever syndrome characterized by fever, chronic recurrent urticaria, arthralgias, progressive sensorineural deafness, and reactive renal amyloidosis. The disease may be severe if generalized amyloidosis occurs. Defects in NLRP3 are the cause of chronic infantile neurologic cutaneous and articular syndrome (CINCA); also known as neonatal onset multisystem inflammatory disease (NOMID). CINCA is a rare congenital inflammatory disorder characterized by a triad of neonatal onset of cutaneous symptoms, chronic meningitis and joint manifestations with recurrent fever and inflammation. Belongs to the NLRP family. 5 isoforms of the human protein are produced by alternative splicing. 1. These findings demonstrate a role for the surface charge of particulates in the activation of the NLRP3 inflammasome, which should be considered when designing a novel vaccine formulation.